Hyundai Heavy Industries Co., the world's largest shipbuilder by sales, said Sunday it has slashed a third of its executives in its offshore and engineering division as new orders have dried up. The move came a month before the shipbuilder is due to suspend work at its offshore facilities shipyard. The suspension scheduled for August is the first in 35 years. Hyundai Heavy has lost out to Chinese and Singaporean rivals in offshore projects in recent years due to higher costs. The labor costs of Chinese and Singaporean shipbuilders are roughly a third of Hyundai Heavy's. The suspension will result in a large number of idle workers. Hyundai Heavy said it has created a task force with its labor union to discuss what to do about the idle workers. The union demands paid leave for workers in rotation, but the company is considering various options and no decision has been made yet, according to a company spokesman. The shipbuilder employs 15,795 people, 2,300 of whom are assigned to the offshore and engineering division. 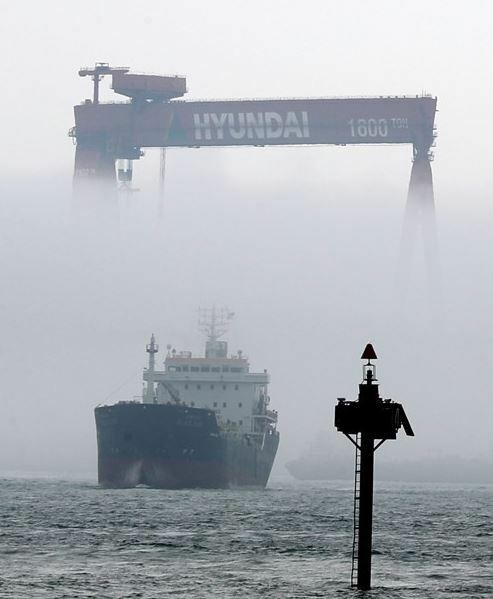 Hyundai Heavy has two major shipyards in the industrial city of Ulsan, about 410 kilometers southeast of Seoul. One builds commercial vessels, such as container carriers and liquefied natural gas tankers, and the other makes high-end offshore facilities, such as floating production storage and offloading units. Around 4,000 employees left Hyundai Heavy under voluntary retirement programs between 2015 and 2017. Meanwhile, job cuts appear to be looming at Samsung Heavy Industries Co., another major South Korean shipbuilder. In 2016, Samsung Heavy Industries promised to cut about 30 percent of its 14,000 employees by the end of this year. Earlier this year, Samsung Heavy cut the number of its executives to 50 from 72. Samsung Heavy CEO Nam Joon-ou said in January his company is in crisis due to a falling order backlog. Meanwhile, Daewoo Shipbuilding Marine & Engineering Co., the world's second-largest shipbuilder by orders, said it had $22.4 billion worth of orders, or 96 ships, in its order backlog as of the end of May, which would keep its shipyard busy until the third quarter of 2020.